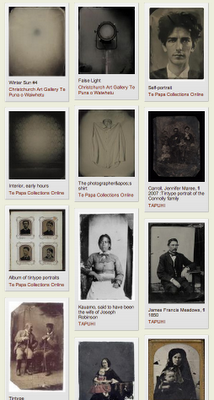 Today on the radio I talked about Ben Cauchi at City Gallery and Angels & Aristocrats at Te Papa. So, today I leave my current job at Boost New Media and start my new job as Director of the Dowse art museum. And while I feel like Christmas has fallen out of the sky and landed on me, I’m still torn about leaving my team and some of our projects behind. It’s been two and a half of the proudest and happiest years of my life, and I’ve been so well cared for. I’ve been musing about leaving ever since I started thinking about applying. And the more I’ve thought about it, the more I’ve realised that what I will miss most is being surrounded all day by people speaking a foreign language. About two metres away from where I sat in the office are two pods of developers. And while I typed and talked and talked and typed and occasionally drew pictures with straight lines and grey boxes and blue text, I would overhear them murmur and sigh and laugh. Words – strange, marvelous words that ranged between the familiar and the incomprehensible – flowed between them, rose off them like mist and floated over to me. And I would pluck them out of the air and savour them. I have come to picture these words in all sorts of ways. Sometimes they are rocks in a river that I balance on, jumping from one to another as a rush of information flows around me. Sometimes they are balls flying over my head, passed between the tall kids, which occasionally I get my fingertips on. Sometimes I think of them as small river pebbles, these well-worn objects that feel familiar until I pick them up, turn them in my hand, and realise they are little mysteries. There is a rhythm and pleasure to being surrounded by this talk that reminds me so strongly of being a gumbooted, Swandri-ed child, dreamily listening to farmers talk at the sales yards, swapping grazing numbers and eczema spore counts and milk solid prices. I have also come to think of the words as seasons. The words come and go, in waves – every three months or so, one set seems to be replaced by another. Just when I was becoming fond of a word and would wait in meetings, ears pricked for someone to use it, ready for that little shimmer of recognition, it would leave us, and a new word take its place. Of course, there will be words in my new place. Mostly words that I know, some words that I’ll learn – words that I’ll love and words that I’ll employ because they’re useful, if not elegant or enjoyable. But they’re words from a world I already know. These strange and wonderful words that I’ve been living with, from a strange and wonderful world that I’ve been lucky enough to have shared with me … I will miss the sensation of occasionally grokking the great unknown. There are five words in particular though that I will take away with me. 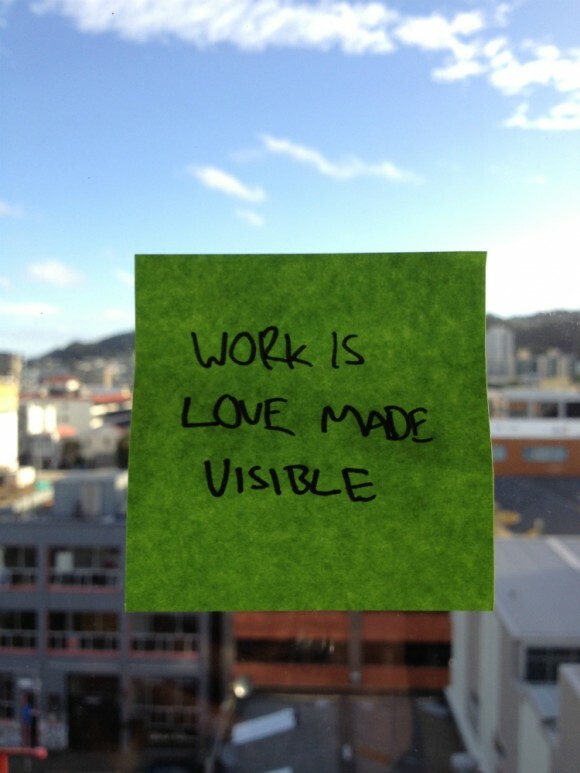 They are written on a post-it note and live on one of my dev’s (only, not my dev now) machine. And they say this. These are the words I take with me. 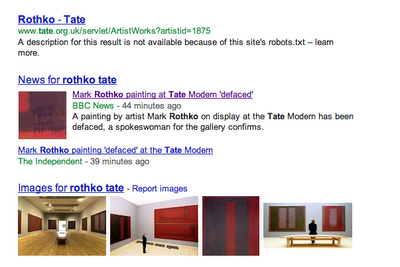 I can't describe how much I am looking forward to re-immersing myself in the art world. But I will also miss my current world terribly (perhaps I should switch the tagline of this blog to One foot in the web world). I'll miss the people, the energy, the aspirations, the belief, the optimism, the honesty, the giving and sharing, the unending push to do better, faster, smoother, more delightfully. I will miss the reckless joy and good sense and occasional snark. And oh - oh, I will miss the language. I have spent the last six or seven years swimming in a vast ocean of words and concepts: sometimes I caught a wave, sometimes they swept over my head, occasionally I got dumped on the shore of confusion and muddle. As I thought about this over the last few weeks I started collecting words and phrases, which I have compiled here: Goodbye to all that. And hello to all this. Few things are more alluring than behind the scenes access to museums and galleries. My favourite view of an exhibition is always when the wrappings have come off and the works are leaning on sponge blocks against the walls, and you can squat down in front of them and get nose to nose in this totally unfamiliar way. 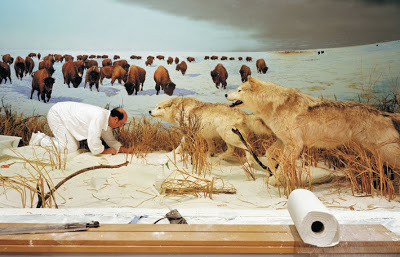 A recent book by American photographer Richard Barnes documents amazing storage and installation scenes in natural history museums. They reminded me, of course, of Neil Pardington's The Vault series, and Laurence Aberhart's photographs of the pre-merger National Museum. So, composer Nico Muhly is totally my blogging crush. 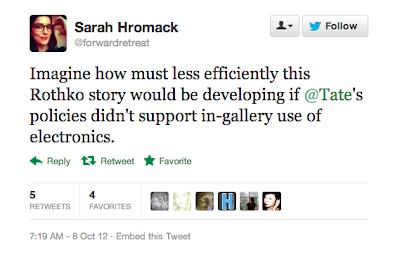 And this recent post exemplifies why. It's stream of consciousness mixed with bright insight, and wanders everywhere from student critiques to Donald Judd to hotels full of convention guests ... effortlessly. You guys! Northern Kentucky Univeristy is no joke. It’s a beautiful brutalist series of structures with very little ornamentation: a little grass here, a little potted plant there. It’s very very satisfying, especially at dusk, and they have all this random Donald Judd kicking around including Box and I was so happy. Does anybody else ever have that romantic tingle when you see where you can fly to from places that aren’t where you live? The idea that there is a direct flight from Alaska to Hawai’i is unspeakably touching to me. A little flurry of tweets around new twitter/presentation slide techniques have got me thinking. I want old presentation technology to make a comeback. I want to sit in a darkened room and re-experience the glow and soothing ker-chunk, ker-chunk of the slide carousel. I want someone to scribble on sheets of OHP as they excitedly explain something. I want blackboards and chalk - fingernails and all. I want someone to stand at a lecture for an hour and speak from memory with no props. I can actually see a product in this for the hipster market. Imagine this. You're sitting at home working on your Keynote slides. You finish up your glorious presentation, which is totally Zen. And then you log into a website - let's call it Carouselize for now - and upload your digital file. The next morning, a package lands on your doorstep. Inside it is a slide carousel pre-loaded with your deck, which has been converted into slide transparencies. You roll up to your presentation - where the horrified organisers have spent the past week trying to rustle up an old-school slide projector, calling in favours from all over town - push your hipster glasses up your nose and proceed to deliver that lecture like it's 1992. Children in the audience are enthralled by your mastery of dead technology. Grown-ups swoon over nostalgic recollections of lectures they slept through during the best years of their lives. We can go further, of course. Why not print your deck as a broadsheet? What about having a telegrapher bashing out the salient points in Morse code and sending them through to Little Printer? What about a stenographer taking notes to be mimeographed? Why not send everyone a handwritten letter full of distilled wisdom at the end of the conference? I'm not going to suggest slates instead of iPads though. That would just be silly. Tonight is the opening at City Gallery Wellington for Ben Cauchi's survey exhibition The Sophist's Mirror. A few months ago I was asked by the good people at the Gallery to give a talk about Cauchi's show near the end of the season. It's been lovely to have this super-extended lead time to mull over my thoughts, and I'm looking forward to dropping by the show frequently to test my ideas against the objects. In the meantime, you should check out this episode of The Gravy featuring Cauchi, which gives a wonderful insight not just into how he works, but also how he thinks about his work (my favourite moment is when he talks about beautiful imperfections). I also used the sets functionality on Digital New Zealand to bring together a selection of Cauchi's work with examples of the processes he uses: wet collodion plates, tintypes, ambrotypes, salt prints. This had the interesting result of making Cauchi's look more contemporary, not less. It's also been interesting imagining the hang of a show I've not been at all involved in. For example, I see interesting visual and metaphorical resonances between the self-portraits and the portraits of cameras (I have always loved how the National Library uses 'portrait' to describe photos of non-humans, like motor vehicles). I wonder if that will be drawn out in the show. 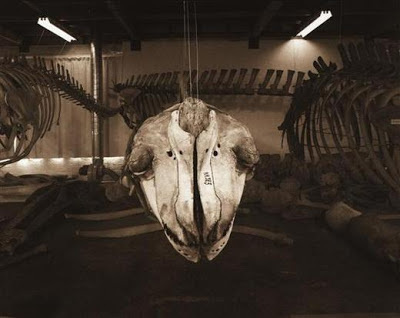 And I have noticed, going through the work on Cauchi's website, the repeated visual motif of the glowing heart in the centre of the photos - sometimes a glowing object, or a halo around an object, or simply a space that's made active by being lit up. I wonder if I will see this being repeated round the walls? It all makes me wonder if there is something in offering people the opportunity to remix or rehang a show - on paper or online. Would visitors take it up, or is this something only a geek like me (by which I mean, a person with specialised and deeply committed areas of interest) would be keen to do? Today on the radio, I'll be talking about the Rothko defacement, and the Met's release of a chunk of its publishing back-catalogue online. My new favourite thing on the internet is the NDF speakers' playlist. Ever spoken at a conference and wondered what the sound track would be like? And even if you haven't, here's your chance to create the definitive sounds of NDF2012. If you're speaking at NDF this year, nominate your top 5 tracks and Wellington's own Bill Nothingelseon (http://twitter.com/nothingelseon) will mix up the list on http://soundcloud.com. It grew - as these things so often do - out of a random conversation on twitter, and is now taking a life of its own. I'm loving picking through people's music - being surprised (and not surprised) by people's taste, forming pictures of people I haven't met yet. It's like a Webstock conference (recently? a couple of years ago? 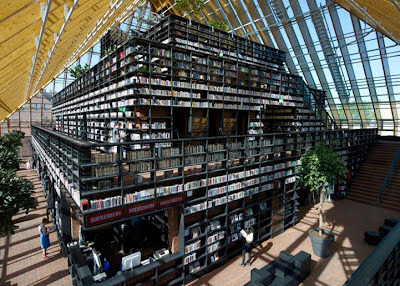 I lose track) where I wanted all the speakers to recommend their favourite or most recently read books. 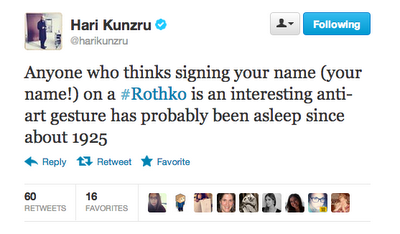 I want to get inside the heads of these people. And it makes me want artists to put together playlists to go with their shows. I would love that. How to show an artist whose work has increasingly become his life, his voice, and his digital output? It's a question being debated by critics in America as Ai Weiwei's survey show, Ai Weiwei: According to What? opens at the Hirshhorn Museum. Tellingly, the opening label of the Hirshhorn show identifies Mr. Ai as “one of China’s most prolific and provocative contemporary artists” rather than one of its greatest or most original. Too often in this exhibition, the objects come off as a window dressing that is all but overshadowed by the celebrity, pronouncements and predicaments of the artist himself. They suggest that he doesn’t make great art as much as make great use — amplified by digital technology — of the role of the artist as public intellectual and social conscience. 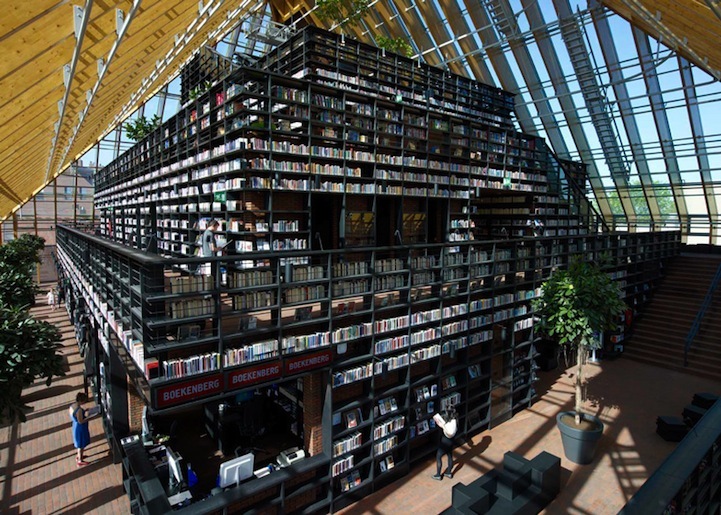 What if an art gallery was designed to show its collection on the outside, like this library? What about sun damage? Apparently, the average life of a library book is 4 years; long term care is not an issue here. So, sure. It might not work for oils and watercolours. But it's a hell of a statement - both visually, and as a distillation of what you do and what you are. MCA Tribute at the MCA from James Beswick on Vimeo. 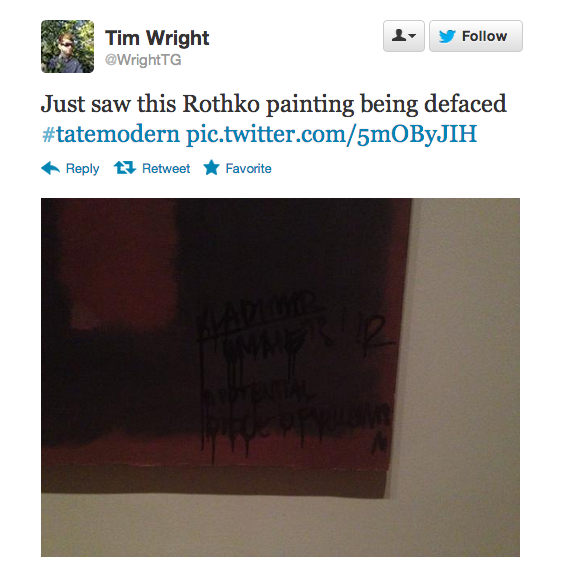 A painting by Mark Rothko hanging in the Tate - confirmed by a Tate spokesperson as one of the Seagram murals, and identified by Hyperallergic as Black on Maroon (1958) - has just been vandalised, with a visitor writing a short message in black ink or paint in the work's lower right corner. This is kind of amazing to me. There is utterly no way for the Tate to 'manage' this story (and as of right now, no-one is updating their Twitter account with details). It's happening in real life and real time. There's no chance for emergency meetings and agreeing on a message - pretty much everything that's there to be known is known and already public. Another aspect of this that interests me is the long term implications. When this incident enters the long, long history of defaced artworks in public galleries, it will come with a flood of documentation; eye witness accounts, immediate and more considered reports, analysis and speculation - perhaps even statements from the perp. A history of this act of vandalism could start being written tonight (a day is a loooooooong time on Twitter). Barcamps (sometimes called unconferences) are participant-driven events where the attendees both create the agenda and run the sessions. These NDF barcamps are an opportunity to get together with others in your region and share ideas about the digital work of museums, libraries, archives, galleries and others in the broad cultural heritage space. These barcamps are free half-day events, being run the month before NDF conference in Wellington. So it's also an opportunity to start a conversation to continue at the conference… or get a taste of NDF and contribute locally if you can't make it to the full conference. Speaking of the conference: early bird pricing closes on 9 October, so get in quick. (It's not too late to register your organisation as a member to take advantage of the registration subsidy either.) And I was reminded by tweet the other day that I'd actually written a list of reasons why you should attend this conference: they're not half bad. Today on the radio I'll be talking about the Len Lye Centre in New Plymouth getting its funding, Gustav Klimt’s last studio being reconstituted in Vienna, and Rob Cherry, Joe Sheehan and Peter Trevelyan shows at Pataka in Porirua. Here's the gallery of images, and the audio. I also managed to slip in an impromptu minute on Peter Robinson's new show at Peter McLeavey's. 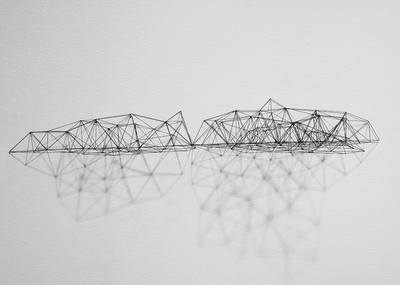 Peter Trevelyan, Profiles, (I think), currently on display at Pataka. 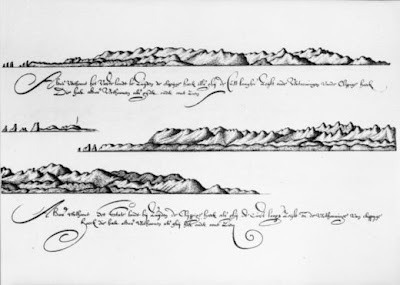 Isaac Gilsemans, Thus appears the main land to south of the Rocky Point [Cape Foulwind] when you sail along the coast and views of the Rocky Point..., 1642. Alexander Turnbull Library. I got so happily immersed in this and other drawings I made a set of coastal profiles and hydrographic maps on DigitalNZ. 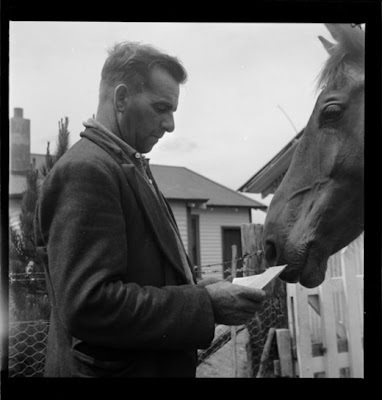 If I tallied up all the time I have spent trawling through the National Library's digitised image collections and then visualised where that time was spent, the biggest bubble would have to belong to photographer John Dobree Pascoe. Born in Christchurch in 1908 (the elder of twin boys - his brother Paul would grow up to become an important architect) from his early 20s Pascoe was a keen mountaineer (and a less-than-keen clerk in his family's law firm). He discovered a talent for photography when he began making records of routes and tracks using a camera. 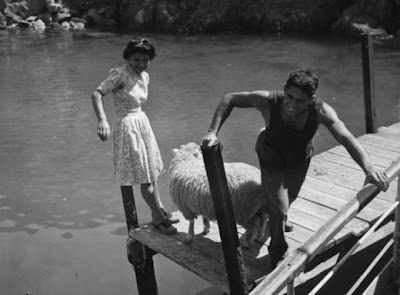 In the 1930s Pascoe moved to Wellington. In 1937 he wrote to Joe Heenan, under-secretary at the Department of Internal Affairs looking for work. Heenan eventually made him the illustrations editor for the 30-part Centennial series Making New Zealand. In 1942 Heenan appointed Pascoe as an official war artist, and he travelled the country documenting New Zealanders' wartime life. Pascoe had a long career with DIA, as well as publishing as a photographer and writer in his own right, including being the founding secretary of the Historic Places Trust and as chief archivist at the National Archives. 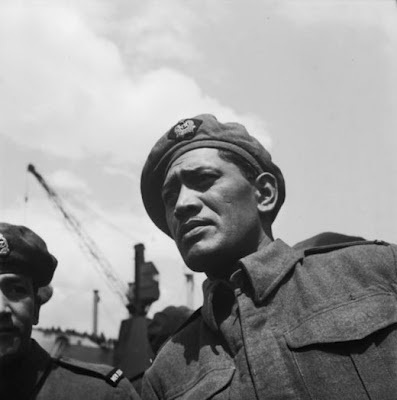 Pascoe was still in this role when he died in Christchurch in 1972. 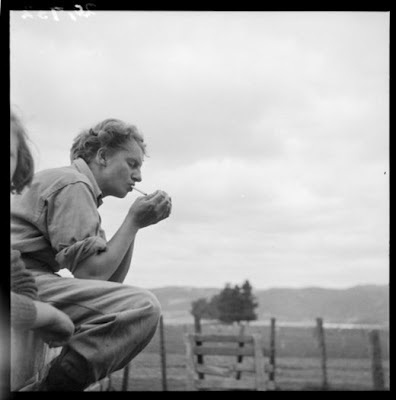 John Pascoe, Land girl, Carol Sladden, having a cigarette, Mangaorapa, Hawke's Bay, 1943. Alexander Turnbull Library. 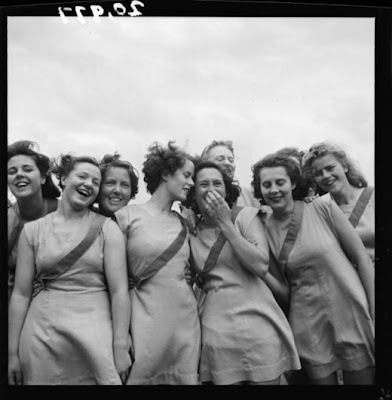 and his photos of the returning Maori Battalion. John Pascoe, Joseph Takuta, 1946. Alexander Turnbull Library. 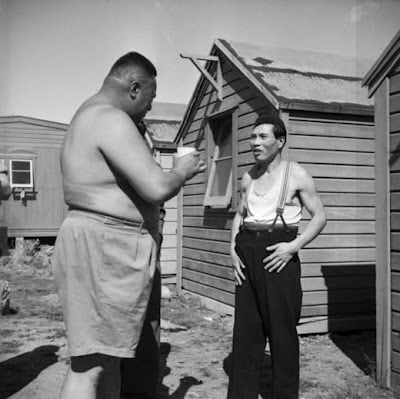 John Pascoe, Maori guard and prisoner at the Japanese prisoner of war camp near Featherston, 1943. Alexander Turnbull Library. But if I was going to pick one photo - just the one - to transport myself into, it might be this scene at Easy Bay, Arapawa Island, one of a number of photos associated with mail launches that I find deeply appealing. John Pascoe, Jetty at East Bay, Arapawa Island, c.1945. Alexander Turnbull Library.